Conceptual Portrait: Zach Condon (Beirut the Band). If you are familiar with Beirut then you'll know how Zach is like a Chef he creates sweet music mixing influences from his European travels & his personal background. I kept thinking of Zach as a creator that's why I have him dressed as a Chef mixing music instruments, flowers, & strawberries in a bowl. I used gouache but I have dry brushed it in order to try something new with gouache. Deadly Sin: Sloth. This is my take on sloth, it was fun coming up with all the objects laying around .. 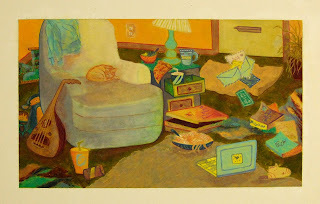 I used gouache for this assignment too. 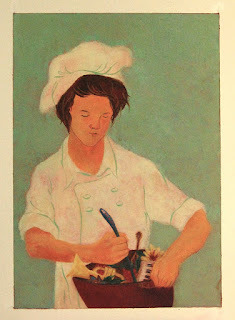 I love how you made Zach (a musician) a chef..
Last 3 Illustration Academy assignments ..